Students, families, space enthusiasts, and NASA, military and political officials celebrated the reopening of the space shuttle Enterprise pavilion at New York’s Intrepid Sea, Air and Space Museum July 10. The reopening event featured speakers, a ribbon-cutting ceremony and a performance by the New York Police Department Marching Band. 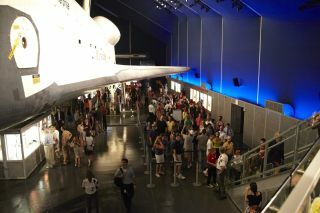 NEW YORK — Crowds showed up in force Wednesday (July 10) to see the space shuttle Enterprise open to the public — again. The display of the prototype shuttle, which was donated to Manhattan's Intrepid Sea, Air and Space Museum by NASA, reopened after its first exhibition was closed due to damage from last October's Hurricane Sandy. The hurricane devastated the temporary structure that had been erected around the orbiter on the deck of the aircraft carrier-turned-museum. That first show opened July 19, 2012, but closed for extensive refurbishment after the storm. Finally, the Enterprise display is again open for business. A.J. was similarly impressed, calling the display "amazing," and saying he hoped to become an astronaut some day. "I will be the first astronaut on Saturn," he said. Many who came to see Enterprise were awed by its size. "I'm surprised how big it is," said Matt Morales, age 13, of Montvale, N.J. "It's a different experience to see it in real life." Kate Novak of New York agreed. "It's really intense. I thought it was going to be much smaller. It's surreal." Space shuttle Enterprise never flew to space, but was used by NASA in the 1970s for glide flights from the upper atmosphere to test the space shuttle design. The vehicle is displayed in a darkened tent with a deep blue ceiling that evokes the depths of space. Around it are numerous exhibits explaining the science and history of the 30-year space shuttle program and the role Enterprise played in getting it off the ground. "The exhibit seems to be fitting, the colors. [Enterprise] is kind of orbiting in the center," said Emily Potter-Ndiaye of Brooklyn. While many in the crowd today were locals, some visitors from far-flung locales decided to check out the precursor to America's shuttle program. "It's super impressive. We don't have anything like this in Australia," said Lily Grealy, who was visiting New York from Sydney, Australia. Intrepid officials said they're hoping the display helps inspire children to pursue science, math and engineering, and maybe even travel to space one day. "It's pretty cool," said 10-year-old Georgia Wallace, who was visiting Enterprise with her father Daniel Wallace. Despite being wowed by the shuttle, though, Georgia said she didn't want to go to space herself. "There's no showers." The Intrepid Sea, Air & Space Museum is located at Pier 86 (46th Street and 12th Avenue) in Manhattan. Access to the Space Shuttle Pavilion costs $7 for adults and $5 for children ages 3 to 17, in addition to regular admission. The Intrepid is hosting a public SpaceFest, July 25-29, 2013, with NASA astronaut appearances, free movie screenings, hands-on demonstrations and more to celebrate all things space.